While a week at a Mexican resort would have been more luxurious, PSG partner Paul Gidus opted to devote a week of his time this past summer to a unique organization which builds houses for needy Mexican natives. 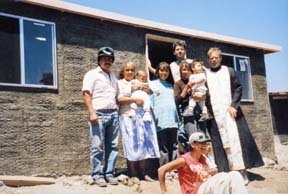 Called Project Mexico and founded by an Orthodox Christian couple who also operate an orphanage for Mexican boys, the organization uses the labor of willing volunteers who spend five days constructing small homes on equally small lots. The houses are less than modest. Measuring 11’x22′–the size of an average American family room, the uninsulated houses consist of two rooms, concrete floor, flat roof, and used windows and door. There is no plumbing or bathroom. Paul worked with a crew of men and women who had no building experience (except a priest with construction experience); the only requirement was that volunteers could hammer a nail and put in eight hours of physical labor each day. Breakfast, lunch and dinner consisted of the same menu: flour tortillas, beans and rice. The crew slept in tents at the nearby orphanage. At the job site, crew members shared a makeshift outhouse used by neighboring residents. “It made the Port-a-John’s on our job sites look great,” Paul recalls. Meeting the woman for whom the house was being built was a highlight for Paul. “She was thrilled because we finished her ceiling with drywall; similar homes just had exposed framework. She also had a concrete floor instead of the usual dirt,” Paul explains. Mexicans applying for a home provided by Project Mexico must meet two requirements many are hard-pressed to fulfill: own the property the home is to be built on and be employed. Typical jobs in Mexico pay approximately $35 a week.